Eagle Rare is a single barrel bourbon from Buffalo Trace. It’s produced at two different ages – 10 and 17 years – with the older of the two being part of Buffalo’s Antique Collection. There’s always a slight hazard in reviewing single barrel spirits, because inevitably every barrel has it’s own variations. That’s the whole point of a single barrel release, after all. Buffalo acknowledge this with a rather contradictory note on its website, saying that individual barrels “offer consistent flavor but with a seemingly individual personality“. So, consistent but individual! Eagle Rare 10 Year Old is the more readily available of the two editions. The nose is classical bourbon – caramel, charred wood and vanilla. Over time, more delicate honey notes come through, along with dried orange peel. Water brings out the wood even more, revealing it’s charcoal character nicely. In the mouth there’s a bit tannic bitterness that quickly overwhelms the initial sugar. There’s some residual toffee underneath, and even some dark chocolate notes. The finish is actually quite pleasant, but it’s spoiled by that initial harshness. 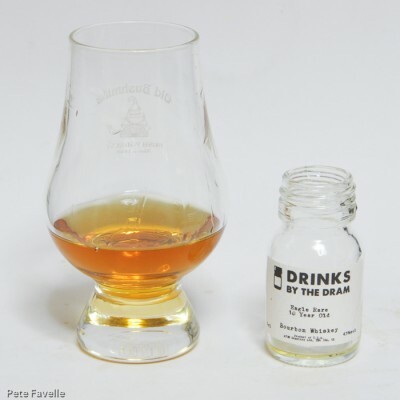 Watered, the mid-range harshness is reined in somewhat and it becomes quite an easy drinking bourbon – toffee sweet with a nice dry undercurrent, the wood lingering to the very end. This one needs water, but once it has a drop it earns 3 stars.